With the backing of a 21,000-signature “hold the wall” online petition, an alliance of six First Nations who live directly along the pipeline route says its members are willing to put up a massive fight to prevent the project from crossing their territories. The first such action by indigenous women has already been announced. On Friday, Gitga’at First Nation women have pledged to stretch what they’re calling a multicoloured crocheted “chain of hope” across the more than 3.5 kilometre-wide Douglas Channel — a symbolic blockade against oil tankers, organizers said. In his statement approving the project, Natural Resources Minister Greg Rickford said the government accepts the National Energy Board’s Joint Review Panel recommendation lsat December that Enbridge must meet 209 conditions before proceeding — a goal the company says it’s already on track to meeting. “Today constitutes another step in the process,” Rickford said in a statement. “Moving forward, the proponent must demonstrate to the independent regulator, the NEB, how it will meet the 209 conditions. It will also have to apply for regulatory permits and authorizations from federal and provincial governments. Enbridge says its $7-billion project would create 3,000 jobs in construction and 560 long-term jobs in the province, and that it has addressed widely held concerns about the risk of an oil tanker accident or a pipeline spill. The pipeline would transport 200-million barrels of diluted bitumen a year from Alberta’s oilsands 1,177 kilometres to Kitimat, B.C., where it would be loaded onto oil tankers bound for Asian markets. “There’s such outspoken opposition and disdain for this that has surfaced,” Wilson Raybould told The Tyee. “The reality is that people in this province, beyond First Nations, will let their feelings be known. Coastal First Nations executive director Art Sterritt hinted at a May 10 rally that several other bands are already preparing lawsuits against the controversial project, saying they were not consulted and their concerns not accommodated. The pipeline could spend years mired in legal challenges, he said. In response to the announcement, a group of nearly 30 B.C. 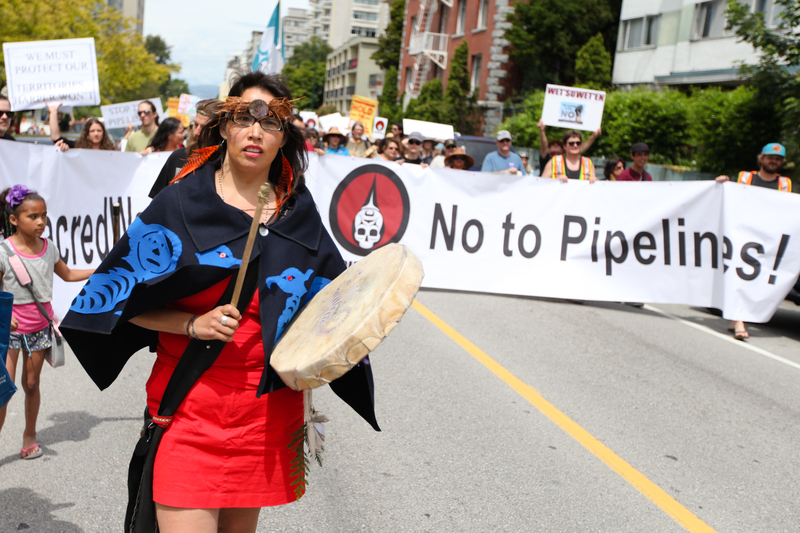 first nations and tribal councils said they “will immediately go to court to vigorously pursue all lawful means to stop the Enbridge project.” The statement, distributed by the Union of B.C. Indian Chiefs, includes endorsements from the Carrier Sekani Tribal Council, Council of the Haida Nation, Haisla Heiltsuk, and Tahltan Central Council. But the Yinka Dene Alliance isn’t waiting for those lawsuits to begin, Thomas Flurer said, and people are already on the ground preparing for battle. She said they’ve been getting ready since Enbridge first arrived in 2006 touting the proposed benefits of its project. The federal green light has left First Nations with a “feeling of being let down, really let down,” Thomas Flurer said. The Yinka Dene Alliance is made up of six northern B.C. bands: Wet’suwet’en, Takla Lake, Saik’uz, Tl’azt’en, Nadleh Whut’en, and Nak’azdli nations. Thomas Flurer said she’s “praying and hoping” the province’s premier will continue to “stand up” for her own five conditions for backing the project, including improved oil-spill response systems, involvement of aboriginal groups, and a fair share of revenue for B.C.